Eric Hamilton's Business & Technology Blog: Are We The Borg? So, I recently moved from Los Angeles to the New York city area . Upon arriving, my new place had no electricity. Oh no, 24 hours with out electricity for the Internet Guru. What is Imma gonna do? No electricity? No problem for now because I powered up my laptop I noticed that a neighbor had not secured his wireless network. Cool, I was able to get on the internet. Thanks neighbor. My laptop and Blackberry couldn't run indefinitely on batteries. So, I decided to charge them in my car. I don't have a car charger for my Blackberry but I have a portable car power converter which converts a car cigarette lighter into a regular wall outlet. So, after a few hours on the laptop and talking on the Blackberry, I went to my car for some SWEET ELECTRICITY! With in 5 minutes of charging, both of my cigarette outlets died. What? What are the chances of that? I've used this power converter for 6 years with out incident. No Blackberry, no laptop, no cable... It was like living in the 1970s or something. It got so bad that I wrote this blog entry using pen and paper. I felt so disconnected. I felt like Hugh from the Borg on Star Trek. The Next Generation Star Trek fans feel me here. The rest of you are scratching your heads so please let me explain. Star Trek is a futuristic TV show which takes place in the 24th century. The Borg are a race of cybernetic organisms (half humanoid, half machine) who desire to convert all of humanity into Borgs. There are millions of Borg but they are essentially one entity, one collective with one conscience in constant communications with each other. There was an episode of Star Trek when the humans captured a Borg and named him Hugh. Our Star Trek humans then severed Hugh's "internet connection" with the Borg collective and Hugh "went out like a punk". Dude was pathetic and didn't know how to act. Similar to Hugh, I experienced the disconnected feeling. I couldn't check my 6 email accounts, my Myspace email, my online bank statements, my online credit card statements, my stocks and 401K, or my Yahoo front page news. I couldn't even check or update my Facebook status. Oh no... I was disconnected from my collective and "Didn't know how to act". 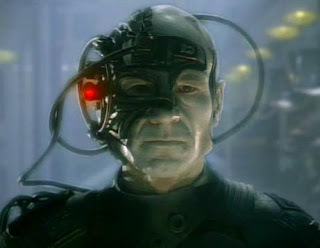 So, my question to all of us: "Are we becoming like the Borg?" You require time to create that attractive and in addition real effort to make such a high-quality blog post Eric Hamilton's Information Technology Blog.